The New Testament has been the focus of Kruger's research and writing for many years. It is an exciting field of study that probes into questions that have long fascinated both scholars and laymen alike, namely when and how these 27 books came to be regarded as a new scriptural deposit. But, the story of the New Testament canon is bigger than just the 'when' and the 'how'. It is also, and perhaps most fundamentally, about the 'why'. Why did Christians have a cannon at all? Does the canon exist because of some later decision or action of the second- or third-century church? Or did it arise more naturally from within the Christian faith itself? These are the questions this book is designed to address. 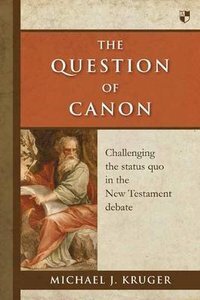 About "The Question of Canon: Challenging the Status Quo in the New Testament Debate"
Michael J. Kruger (Ph.D., University of Edinburgh) is associate professor of New Testament and academic dean at Reformed Theological Seminary, and the author of a number of articles and books on early Christianity. He is the author of The Gospel of the Savior (E.J. Brill, 2005), co-author of Gospel Fragments (Oxford University Press, 2009) and The Heresy of Orthodoxy: How Contemporary Culture's Fascination with Diversity has Reshaped Our Understanding of Early Christianity (Crossway, 2010).